What happens when two gluons meet? In most cases they just pass by each other without interacting. Two gluons couple difficult. Does * occur in nature and what is the outcome? 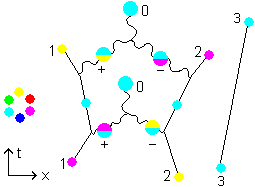 In terms of colorshift this yields +2/6 * +2/6 = +2/6 +2/6 = -2/6 gluon and there are 3 of them: – , – and – . 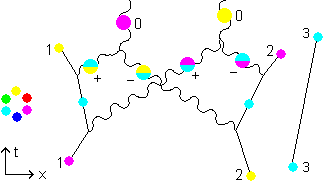 In the next figure the colors of the gluons are all determined by the colors of the quarks they couple to, except for the gray-pictured gluon D that is loose from quarks: it couples to gluons only. Can we find a definite value for the 2 colors of D? - * - = + (D and A merge to E) which is the same rule. The colors then fit nicely. Then quark absorbs gluon +2/6 and becomes . Or quark absorbs gluon +2/6 and becomes . The colors don’t fit. 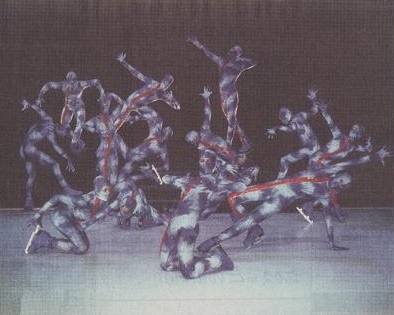 But this is allowed in terms of colorshift. - * - = + and the other 2 solutions are invalid. It seems the reaction can decide between the 2 views, whether one should always follow the colorpaths precisely or that only the colorshifts count. 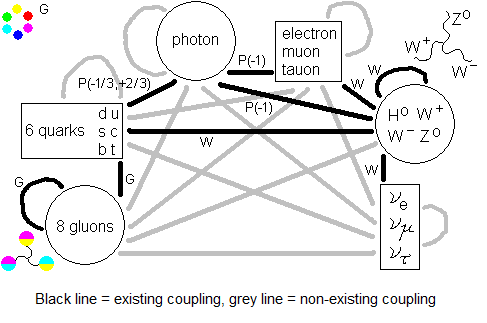 Let’s try to construct a table of all possible gluon-gluon-reactions. We have enough information now. When colors are decisive, a gluon at an intersection point of a row and a column is the product, the result of merging, of the most right gluon in the row and the most upper gluon in the column. For * we fill in . This is a colorless mesonic gluon, part of the time axis. The solution looks different from those obtained with the colorcircle. For reasons of symmetry we fill in for * = * = . This is the gluon multiplication table in timesymmetric representation. Of course there is a normal representation too. 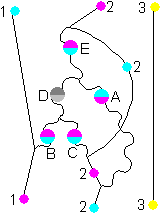 The lower colors shown in the scheme above are changed in their anticolors. Consider the meeting of 2 and 3 hadrons.